So the new update to PvZ2 on iOS has some issues. The bottom 2 or 3 plants are hanging off of the bottom of the screen during play and even more annoyingly it is now showing video ads. Even when using Wireless Data. Ef that noise. I got to Level 100 of Pyramid of Doom and am still going. A couple of weeks ago they introduced a new BattleZ mode to PvZ2 and I am digging it. Only real complaint I have it that it is totally pay-to-win and I imagine that the higher level leagues are all dominated by either people who have spent tons of money or by cheaters who have given themselves every plant at max out levels (they introduced plant levels a while back). 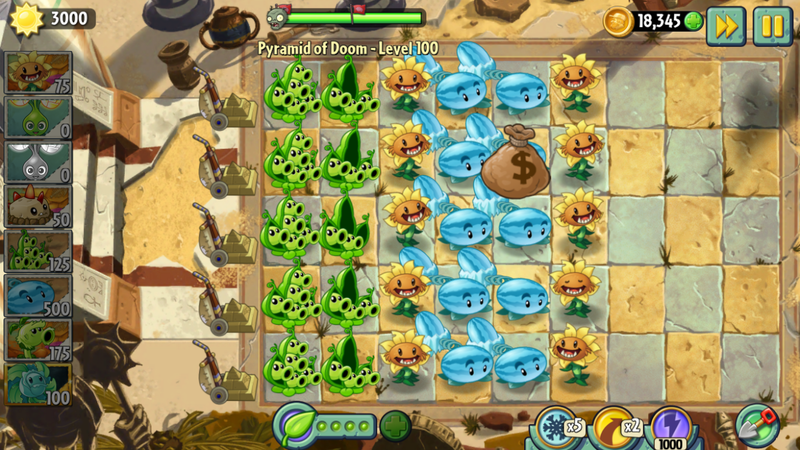 The BattleZ mode feature one plant and one level layout and zombie group each week. There is a bit of randomness to the order the zombies are released in but other than that it is cool that you can spend a whole week refining your strategy. It is a points competition with another random player in your league. Usually when I lose it is because I was matched with someone with higher level plants or a better selection of premium plants. Often when I win it seems that the person I was matched again may not have played the campaign at all because they only have the starter plants and they are all at level 1. You get to see which plants and what level they were at the end of the match. Yeah, don't understand their thinking. You'd think they'd have put this on everything by now. And also shouldn't we be hearing or have heard about PvZ 3 by now? Is the future Garden Warfare? The franchise is too good to languish in maintenance mode. I hear the current android emulators are great. Kind of odd not to have a PC version though. What do you guys think about the current implementation of the powers? I remember playing PVZ2 when it first came out (iPad), and really being turned off by the flick/swipe/drag powers. It felt like I could play "normally", using my plants for defense, but then be forced to use powers to avoid defeat in the last wave of the battle. I haven't tried it in a couple of years. Is it possible to win most stages without using the powers/has their role changed/etc. Nope it still feels that way.